Field care guides for deer are available in many places and quite plentiful on the internet. With turkey season in full swing, I thought it would be good to recap some of the field care methods to help ensure that your trophy bird gets to the taxidermist in good shape. Taxidermists aren’t magicians, and they can’t grow feathers. The field care that you provide will have a direct impact on the quality of the finished trophy. The warm weather inherent in spring turkey hunting can present problems with spoilage, so time is of the essence. Mishandling your trophy bird immediately after the kill can prevent your specimen from ever being a topnotch taxidermy display. The main thing you want to focus on is preventing feather loss or damage. If you are hunting for your trophy turkey, you should bring along some paper towels and a few rubber bands. In your camp or home you should also have a freezer, tape, cardboard, small plastic bags and large black trash bags. If you are lucky, your trophy turkey won’t flop around too much after the kill shot. The more flapping around the downed bird does, the greater the chance of harm to the feathers. Once you approach the bird, you may be able to step on its head to immobilize it and prevent further damage. Or you can grab it by the legs holding it away from your body until it stops moving. Once the bird has expired, gently smooth the feathers in the direction of their natural flow with your hands. This will help to put them back in their natural position. If any large feathers (primary wing, secondary wing, or tail feathers) came off and are lying on the ground beside the bird, pick them up to deliver to the taxidermist along with the turkey. If the shafts of any major feathers are obviously broken or bent, you can try to bend them back into their original position now. Then wrap the head in a paper towel or a rag and secure with rubber bands. If there is any blood on the feathers, rinse it off with cool water. As with any game, you want to get it out of the sun and to a cool place as soon as possible. 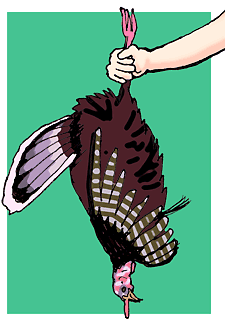 To transport the bird from your field to the camp, carefully carry the turkey by his feet, holding it out away from your body so the feathers don’t get messed up during the hike. If you have to lay the turkey on the ground temporarily, position the bird with the breast side down to minimize feather damage. With your turkey safely back in camp or at your home, again adjust the feather groups by smoothing the feathers into their natural positions, folding them together by gently squeezing and smoothing. This will allow the feathers to naturally adjust to their proper arrangement. It can take up to 48 hours for the turkey to freeze solid. If you have a local taxidermist you can get it to immediately, waste no time delivering it to him. If you cannot get the bird to a taxidermist on the first day of the kill, then you will need to freeze the bird. Then place the entire turkey into a large plastic bag, head end first, and roll it gently to squeeze out most of the air. Tape around the tapered end of the bag containing the tail. Once bagged, the turkey should go into a freezer immediately. Do not put the turkey into the plastic bag until you are ready to freeze as this may cause skin spoilage which would cause the feathers to fall out. If you are in a camp situation without a freezer, you can temporarily place the bagged turkey in a dedicated large cooler with plenty of ice, but make sure the bag is air tight so the bird is not saturated in water. By taking the time to properly prepare the bird in the field, your taxidermist can better utilize your specimen to produce a beautiful lifelike mount of your trophy that will provide you with memories of your special hunt for many years to come. Click here to explore artistic options for displaying your wild turkey trophy in your home, including considerations for different poses and habitat options, in the followup article, Wild Turkey Taxidermy Displays. Click here to download a PDF version of this article to use as a great marketing tool for you to provide to your clients. These PDF files can be printed, emailed, saved, embedded in websites or passed out to your customers.